This week I’m looking for a little reader participation. It’s time to show off! Have you created a family history project using your family photos? E-mail me a photo of it and I’ll either feature it here, or if I receive enough submissions, I’ll put together another slide show. I was inspired by a woman in my town who creates photo quilts. They’re so beautiful, you want to frame them rather than put them on your bed. Let’s see how creative you are! For the last three years I have used old family photos as calendar pages. I worked them up as scrapbook pages, then had them made into calendars for those family members who wanted them, though most weren’t interested. I doubt that I’ll do it again since it’s a lot of work for &quot;ungrateful&quot; relatives. 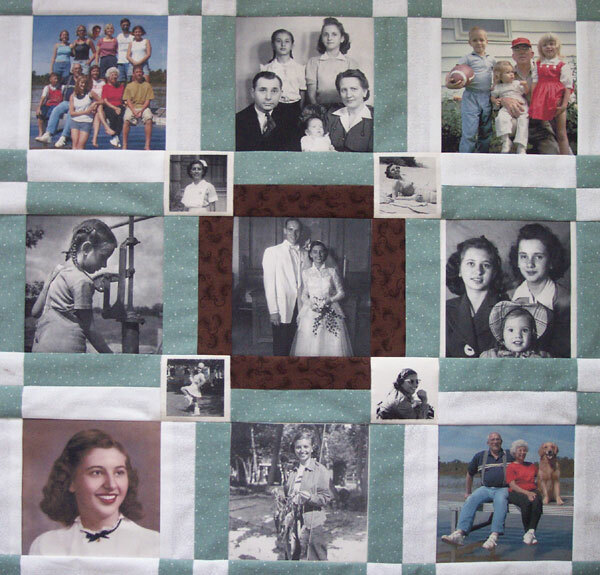 Here’s an image of a quilt that was a joint venture for one of my wife’s aunt’s 70th birthday gifts. I printed out the photos onto printable fabric using an Epson printer. My wife then put the front of it all together, and we passed it off to another aunt who did the rest of it. It was a lot of work, but she loved it.